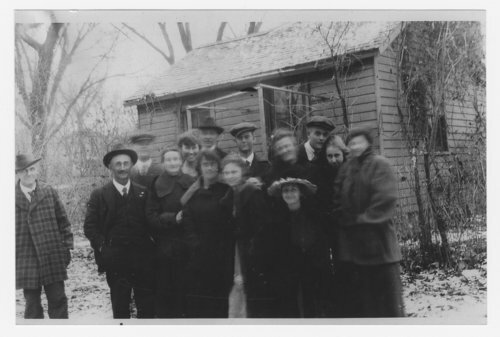 This is a photograph of Knox family in Topeka, Kansas. People in the photograph are: back row (left to right) Harry Humes, Brade Ball, George Knox, Margaret Ball, India Holman, Tom Knox or Lester Wright, Levi Knox, ________, Bill Knox_______, _______, and front row Edith Ball, Lucille Grimes, Emily Ball, and Maymes Grimes (? ).